For Bacon, and Hams. Salt your Bacon and Hams with an equal proportion of bay, and common salt, & let them remain a couple of days. then drain that pickle carefully off. Take two pounds of the coarsest brown sugar, two ounces of salt [prunella? 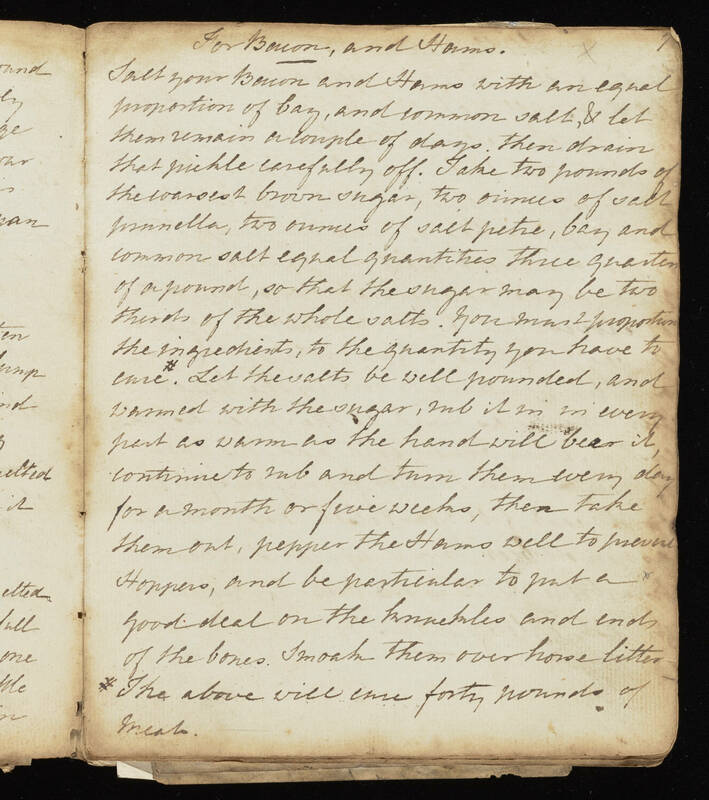 ], two ounces of salt petre,bay and common salt equal quantities three quarters of a pound, so that the sugar may be two thirds of the whole salts. You must proportion the ingredients, to the quantity you have to cure #. Let the salts be well pounded, and warmed with the sugar, rub it in in every part as warm as the hand will bear it, continue to rub and turn them every day for a month or five weeks, then take them out, pepper the Hams well to prevent Hoppers, and be particular to put a good deal on on the knuckles and ends of the bones. Smoak them over horse litter # The above will cure forty pounds of meats.